After reading your article, I am in the process of trying to make the same complaint to see if it gets me anywhere. They (very large bank) don’t give you a chance to rebut or even threaten you. They simply send you a letter stating you have been placed on their ineligible list. In my case, they cited two appraisal reports. One of the reports was on MY OWN house, which I built myself a few years back and have NEVER appraised. The other was in a rural area made up of 40 acre parcels and they did not like my Comp selection. I responded with the facts about my own house and asked to see a review of the rural property as yes, the comps were not great, but they were all I had available and I wondered what sales were found that were considered to be better than what I provided. I was answered with a letter indicating that their decision was final and that the issue is over. The most disturbing part of this is that because an appraisal was cited that I did not complete, one might assume that the reason this report was chosen was due to my name simply being placed into a computer which pulled up any reports that are not perfect reports. Further, this leaves the question whether my report was even reviewed or just selected because it had comps over one mile or adjustments that exceeded recommended lending guidelines. Surely an intelligent person would catch the fact that the report was not even mine if they were conducting a review of my report, right? After all of this, I tried to look at things from their perspective, a business perspective. I understand the reason for blacklisting. However, a blacklist should not be a career death sentence. There should be something in place which gives the appraiser a chance to correct the problem if there is indeed an issue with their work. I spoke to the person from (the very large bank) who wrote my letters of denial. I asked if there was anything that I could do to be removed from this “do not use” list. She informed me that there are no options- that once you are on the blacklist, you are on forever. I informed her that this decision affects ALL work for an appraiser as indicated in your article since AMCs cannot take the chance that it may go to one of the big four and that these decisions should be weighed carefully as this has a huge effect on a person’s livelihood. She did not seem to have any remorse and actually seemed irritated that she had answered the phone. I live in an area made up of many smaller towns, many being quite rural. Most are of second home, resort towns, made up of all custom built houses on differing sized parcels/lots. As you might imagine, appraisals completed in this area are often not great looking reports but we are limited to the data that is available. I wish it were all cookie-cutter tract housing but this is simply not the case. I do honest work to the best of my ability which I think is also true for the majority of appraisers. Editor’s Note: See story: When Nice Guys Finish Last (AMC Complaints Rise). Story reprinted from Working RE’s Online News Edition. Editor’s Note: OREP/Working RE’s AMC Rater Blog is set up as an information exchange on AMCs. There were warning signs about AppraiserLoft, for instance, on the this blog and in other forums. Also, the 2012 AMC Guide separates the good from the bad AMCs, based on the experiences of the author Bryan Knowlton. Good news for appraisers! It is so busy during the first four months of 2012 you do not have to accept low fee work. I have successfully raised my price with the couple of AMCs that allow you to set your own and I have aligned myself with two new AMCs that pay higher. I take private party assignments. I called a local appraiser after seeing a copy of his recent appraisal, made for an AMC; $225 for seven comps. I could not believe my eyes. I called him right and told him I am in the middle of an FHA condo for $370- five comps. 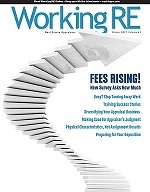 You appraisers who are complaining about low fee work and are setting the fee at $225, are you kidding me? I told this appraiser all he needs to do is call the AMC and raise his price. Leaving $100 on the table for every appraisal is stupidity. You’re not going to undercut anyone but yourself. I am happy to report that life is good, I will make over $100k this year and I ride my bicycle a minimum of three-four days a week to my assignments. I’m going green. Yes, the homeowners are somewhat puzzled by this but are happy to know that they at least have a LOCAL appraiser. By the way, we are fortunate enough to have enough requests to focus on the local work and turn down the more distant orders. I have denied more than five appraisals this week alone. Good luck out there and love what you do. It’s better than sitting in a cubicle making less $ and answering to a machine. I was stuck in that rut for many years.